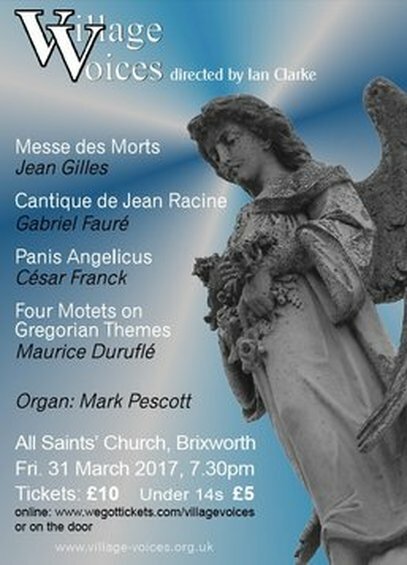 Our last concert was held in the beautiful surroundings of All Saints’ Church in Brixworth which has a marvellous acoustic. The concert had a French theme with works by César Franck, Maurice Duruflé, Gabriel Fauré and the centrepiece was Jean Gille’s ‘Messe des Morts’; Ian is well known for putting together interesting and fairly demanding programmes for his choirs. On this occasion, we drew soloists from our own ranks; Lucy Clarke (soprano), Stephen Vickers (tenor) and Ted Dean (bass). To get an idea of the breadth and depth of the works we tackle, please see our concert archive page here, for details of a number of previous events.